We loved reading your comments in my Without Self-Love, I have Nothing post. Thanks for sharing your experiences! When Eric and I first started dating, we did all of the traditional things that we thought we were supposed to do on Valentine’s Day. We went to the crowded restaurants with long wait times and mediocre food. He bought me the over-priced roses and a box of chocolates. I wrote him a sappy poem and I bought him cologne. We often felt pressure to have a ‘perfect’ day. Then, we realized that we’re not perfect, so we would never fulfill this expectation that we placed on ourselves. But, we could do it our way! We started making homemade silly cards complete with inside jokes. We got each other a thoughtful gift, but we didn’t go overboard. We enjoyed delicious meals in the comfort of our own home, made together. When we did this, we started to enjoy the holiday a lot more. The perfect Valentine’s Day to us, is really the imperfect one. I can’t think of a more perfect way to be imperfect than to enjoy a messy bowl of pasta that leaves red sauce in the corner of your mouth and a few stains on your shirt. And if you’re lucky, your partner will remove it for you..
1. 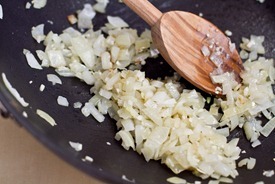 Chop onion and garlic. 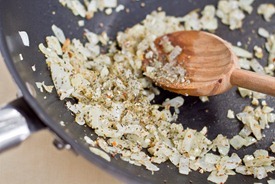 In a large skillet, heat 2 tbsp of olive oil. Add in the onion and cook over low-medium heat for about 5 minutes. Add in the minced garlic and cook on low for another 4-5 minutes until the onion is translucent. 2. Add in the oregano, salt, and black pepper. Stir well. Cook on low for a few minutes. Now add in the 28oz of crushed tomatoes, chopped basil, and nutritional yeast. Stir. Bring to a low boil and then simmer on low for about 5 minutes. Meanwhile, cook your pasta. 3. Stir in the chopped walnuts and the chopped spinach. Cook for about 10 minutes longer on med-low. Serve over pasta and garnish with basil leaves and additional walnuts. Makes about 3.5 cups sauce. 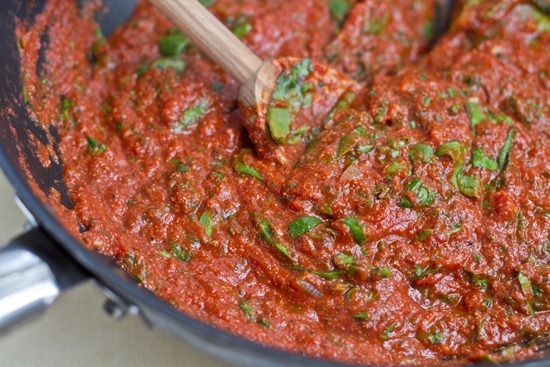 Making this sauce is very easy and it turned out quite delicious. The walnuts were absolutely amazing in this pasta sauce and I would not recommend leaving them out! They really brought the sauce to a whole new level and gave it a wonderful texture and flavour. I’m sure you will ask me if you can leave out the nutritional yeast and I would say of course! The flavours will change though, so make sure you adapt the sauce to suit your preference. The spinach was a fun add-in at the last minute. It is a great way to sneak in some GREEN Monsters. The walnuts were our favourite part about this recipe. I thought it would give the pasta sauce a great texture and nutty flavour and it worked wonderfully! 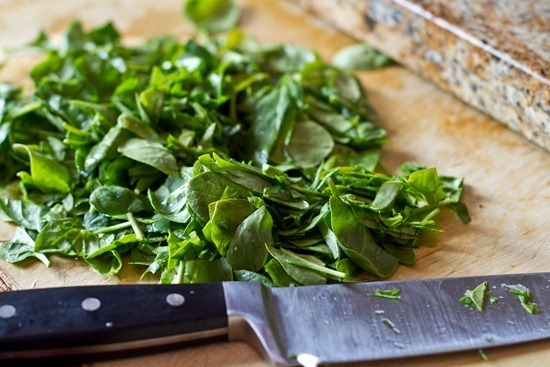 Garnish with some fresh basil leaves and more walnuts and serve! It is also a heart-healthy dish to Go Red For Women. Glo Bar variety packs will be for sale tomorrow, Feb 16th at 10am EST. A personal Valentine’s Day like that means so much more, we did a similar thing – cooked stuffed peppers together, watched our favorite recorded show and played our new favorite game! And now that I found this recipe, I think I should have added walnuts to those stuffed peppers! We stuffed them with barley, cottage cheese, nonfat mozzarella cheese, spinach, garlic and tomato sauce. 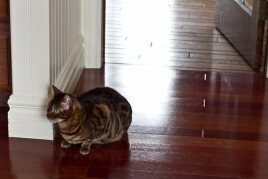 But walnuts….I like it…thanks for the idea. We also make each other silly cards. For me, that’s so much better than a big box of chocolates. We also use Valentine’s Day as an excuse to treat ourselves to a night out of town, because we love doing that. We’re heading to Boston next week! We’ll go out to eat, but when the prices are brought back down and when the restaurant isn’t at max capacity. We are the same way; we stayed in, had a homemade meal (and dessert! ), and just hung out (and even slowed danced together to the radio!). We both thought it was one of the best V-Days we’ve ever had. This looks amazing! I never would have thought to put walnuts in the sauce! How creative! 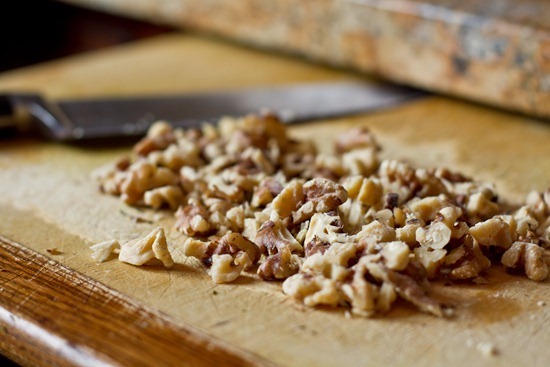 this looks soo good :) walnuts add such a great texture and crunch to pasta dishes. i can’t wait to have fresh basil again.. yum! WOW! I am a pasta lover so I’ll be making this! I even have all the ingredients on hand…that’s dangerous ;). Yay for Glo Bar variety packs, yum yum yum. I aslo agree that the way a couple puts a unique spin on such a “perfect” holiday is the most special. People set such high expectations, it’s better to just be yourselves and do what is special with one another, not cliche! That looks so good! I think the crowded restaurant expensive gift valentine’s day is so cliche now and no one really enjoys it. I think the imperfections in life make everything special. 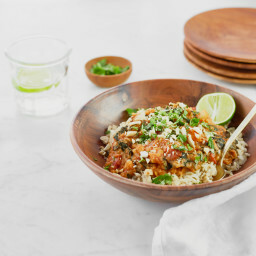 This looks soooo good, never thought about adding nuts, let alone walnuts to dishes like this! What a great protein and healthy fat boost! This looks sooo good! 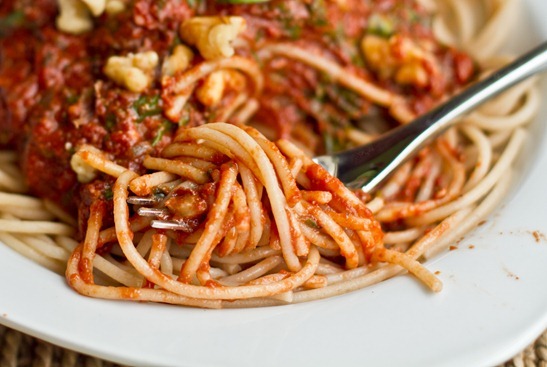 I love thick tomato pasta sauces! My partner will remove the sauce or my shirt? :) Or both? Jason and I had dinner at home (your Vegan Alfredo recipe!) and it was lovely. I think eating at home is much more intimate than any restaurant. I was literally just about to make the same comment about the sauce or the shirt, haha! That made me laugh. I’m glad I’m not the only pervert round here! I love your perfectly imperfect Valentine’s Day..Nolan and I do the same! This year he cooked, I helped clean up and we made homemade chocolates (a la Kath Eats) for dessert! why was pasta on the do not list? Nothing says love like a good dish of pasta! And I love the addition of walnuts. I had a fab Vegan pasta meal a few months ago where the noodles were *made of* walnuts. Neat huh? That tomato sauce looks so rich and delicious, simplicity is amazing. We love lowkey like that too. It makes things so much more enjoyable. 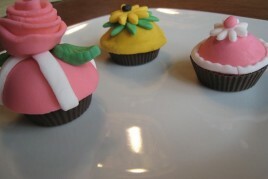 Mmm, cute story and a delicious recipe! Happy belated v-day to you and Eric! I can’t believe people actually go out on holidays. The lines, crowds, and prices are all insane! My tummy just started growling when I saw that dish! Yummy! My boyfriend and I are similar, we don’t do the “traditional” Valentine’s. On Sunday I sent him on a scavenger hunt around the house to find his cheap but thoughtful gift and then we cooked up a butternut squash and chestnut soup which we ate while drinking some wine and watching a movie. I loved every minute of it! I’m ALWAYS on the hunt for new things I can throw into my pasta… now I finally have a use for those leftover walnuts I have sitting around from my Christmas cookies! Beautiful meal, and beautiful message!! We had our first all vegan Valentine’s night meal, cooked at home. Perfect! This pasta dish looks delicious! My husband and I do (and did) the same thing!!! Taking the pressure off of the “perfect” Valentine’s Day is such a relief– and SO much more fun! This looks great! I’ve been experimenting with pestos lately too! Must. Make. This. Soon. Now how to convince my boyfriend that the texture will be fine? (he’s a texture person). Your Vday logic makes sense…we love the imperfections in our partners, so why would we expect that day to be perfect? Imperfections are just as lovely. This looks so hearty and delicious. Love it! I’d rather have homemade tomato sauce than a half-dead bouquet of roses any day. I am going to invest in a bamboo cutting board, your prep photos always look fantastic! My ancient, hacked up board needs an upgrade. I LOVED your lentil walnut burgers and now I have a slight walnut obsession :) This looks delicious! Just quick question, if I do not have nutritional yeast at hand, how much parmesan cheese should I be using? I swear, you must read my mind! I bought a can of crushed tomatoes last week while grocery shopping and could not for the life of me remember what recipe I was going to use it in. And then you post this! And now the can is saved from being in my pantry for months and months, pushed back behind tomato paste and navy beans. What an amazing recipe!!! Angela, how/with what can I replace the nutritional yeast??? thats what I call a Perfect Valentines day! the bf and I do the same, we stay at home and avoid the unnecessary crowds of people and expensive gives. we had a romantic night in with pizza. it was perfect in my eyes. I wanna have a bowl of pasta NOW!!!!!! This looks soooo delicious but simple at the same time – the perfect recipe in my opinion! The same aplies to celebrating “special” days like Valentine’s Day or Anniversaries. 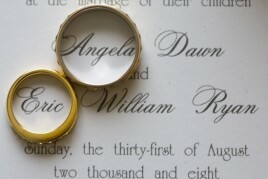 Every couple should figure out their own special way of celebrating those days without having to live up to standards. IMHO, these standards are really only followed by newly loves who have not yet found their own path. 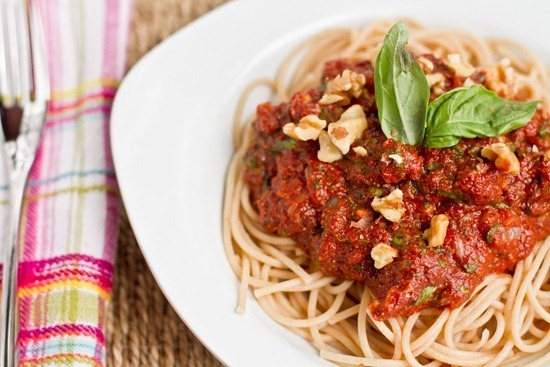 What a seriously perfect pasta sauce! I think I’m in love! 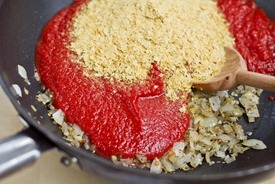 Crushed tomatoes are soooo much better than the jarred sugary pasta sauces. I love the simple additions in this too. I love the idea of imperfect Valentines. The whole day makes my guy extra grumpy (he’s always been anti- “do things cuz you’re supposed to” guy, and frankly the grumpiness and resentment of the day itself only makes him cuter (to me). But last night he had class until 8, and when I finished my run, I realized I had time to run out and get him some groceries (my crotchety old man/boy hates the grocery store a lot), so I just added an extra mile to my workout and was there when he came home. We had frozen turkey balls and pasta- possibly the best Valentines we’ve ever had. Cooking together with the hubs is so much fun! Your fish sounds wonderful and comforting Angela! Stephen and I feel the same way about V-Day. We just like to be ourselves and enjoy the day! We ate pizza and froyo and enjoyed every minute. Oh wow, this sounds wonderful and the pictures are amazing. Agreed on not stressing or spending too much on Valentine’s Day and this looks like a wonderful way to spend it. I just want to make this now – thanks! This might be a dumb question, but is it possible to make crushed tomato sauce by putting some tomatoes in a food processor? Im not sure, actually! Anyone know? My husband and I are big on staying home for Valentine’s Day now too – it’s just too crazy out there and I enjoy being at home more than waiting around for an hour! 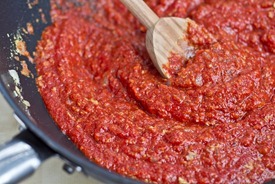 I love putting red-pepper flakes in my pasta sauce, they add just the right amount of kick to your dish. I like the addition of walnuts too, great idea- thanks for sharing! 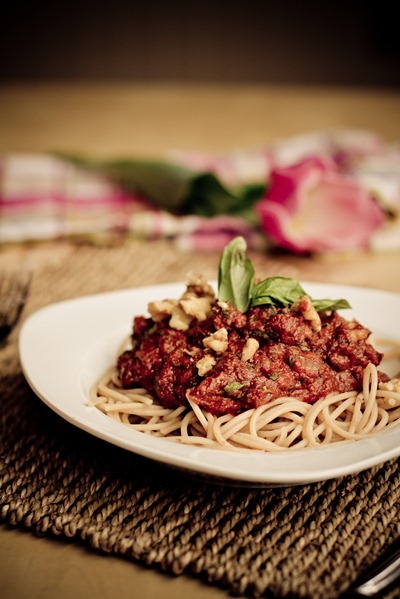 I normally don’t love Italian, but you have me drooling with this recipe! I made your oatmeal raisin cookies last night- with choc chips instead of raisins and with spelt flour. They are so good! I love how they aren’t overly sweet like most cookies. i swear toasted walnuts go great with almost anything!!! savory or sweet! “And if you’re lucky, your partner will remove it for you..” The sauce or your shirt? Sorry, I had to! WOW! That looks so good! The photo’s are amazing! Nice job! Remove the stains or the shirt?! I loveeee the walnuts and how they had a crunch to the pasta! I’d have NEVER thought to put walnuts in pasta sauce, but I will now! Glad you and Eric had a nice Valentine’s day. My husband and I are proud of our imperfection too! And we have a ton of imperfect fun together, on Valentine’s Day and throughout the year!! I agree the best Valentine’s Days are the low key ones that allow you to enjoy the company of each other without any gimmicks or hassles. I love cooking a meal at home on V-day and then taking advantage of the less-crowded restaurants before or after the 14th. 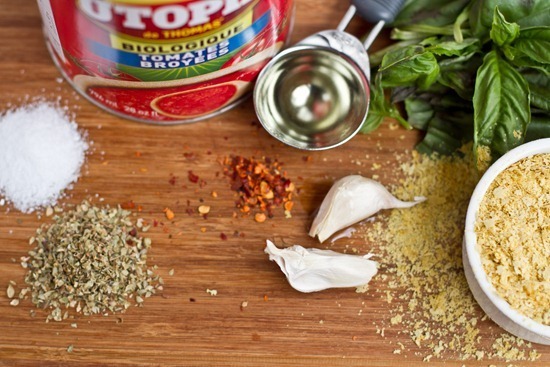 Your pasta sauce looks lovely – I can’t wait to try it! Ohhhh that looks delishhh!!! Guess what! Yesterday I was meandering through Costco’s aisles and just happened to see White Linen sauce!! : DDDD I remembered you raved about it and had to purchase it–I cannot wait to give it a try! We celebrated V-day with brunch the day before and a relaxing dinner at home the night of. I actually made pasta too- vodka pasta (the recipe is on my blog). Yum! Btw…do you use regular pasta or a special vegan pasta? Hey Jenny – I saw your question and thought I’d chime in. You can usually find nutritional yeast in bulk bins at the grocery store, or in health food stores, usually in the baking isle. If that’s not successful, Bob’s Red Mill makes a fantastic nutritional yeast and they have online ordering! AWESOME! Thank you dearly:) I’ve seen a lot of different kinds on amazon but didn’t know which was were actually good. I’m really excited to try this stuff, looks great! thank you! My boyfriend and I made a pasta dinner too – a tomato and white bean I learned in a vegan cooking class. But for next year the walnut red sauce sounds perfect! Oh gosh, I love pasta. I would love this. It looks SO easy! I normally just eat pasta with coconut oil, pepper, salt, and a bit of minced garlic [usually because I’m too impatient to wait for the sauce] This looks so good though, I may break tradition and make this tonight for dinner. I have all the ingredients! The food photography, as always, spectacular! And the opening lines about feeling pressure to have “the perfect” V-Day. Yes, I think most of us can look back and recall a time in our life where that was so important. I even see girls doing it for their spouses’/boyfriend’s birthday. Making an epic event out of it. It’s lovely, but just not a standard I can live up to…I have tried, and I end up feeling meh about it all b/c even after all that effort, I just dont feel like I truly succeeded. That pasta looks phenomenal! I love looking at your photos! Can’t wait to try this one. LOVED your Lentil loaf…how many days do you think it lasts in the fridge? Next time I will freeze half. I think it would last for about 5 days probably? Great idea adding the walnuts. 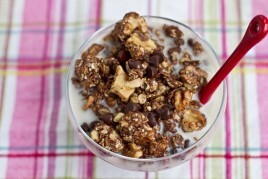 I love a little crunch with any meal! looks fab! My husband and I also had an “imperfect” Valentine’s Day and it was fabulous! I’m not taking your ideas for next year! My husband and I tried to go out to eat last night and have a nice night but it turned out to be one of the worst V-day’s ever! No more expectations-just us from now on! This recipe sounds great! Thank you for including the link to info on nutritional yeast. This looks amazing!! I’ve never seen walnuts used in a red sauce for pasta. THe butteriness must taste wonderful! I like your idea of valentines day a lot more than the “perfect” way! I hope you and Eric had a great day yesterday. I prefer valentine’s days like that too … we go out for dinner/ on dates/ etc. all the time, so v-day is no big deal. No need to fight crowds. Just bought a shaker of nutritional yeast and didnt’ like it in vegan sausage balls (it smells like biology lab…), but I’m willing to give it another try since this pasta recipe looks SO GOOD! ahhhh SO GOOD!! I just made this for my husband and I for supper…definitely going on my favorites list. Thank you so much! This looks delicious. I am making this recipe this week for my family. Can’t wait! Hey, wanted to know if I could use parmesan cheese instead? If yes, then how much would I need to use? I am so gonna make this, over the weekend!! This looks delicious, Valentine’s Day or not! Thank you Glenda! :) I didn’t know it was in print yet. Exciting! This looks amazing! I never would have thought to add walnuts … I’ll have to try it out! We enjoy spending Valentine’s Day together at home, instead of in a restaurant full of strangers. A wonderfully home cooked dinner, a chocolaty home made dessert, a roaring fire, and a movie we both enjoyed watching snuggled up on the couch. Oh this looks so good! 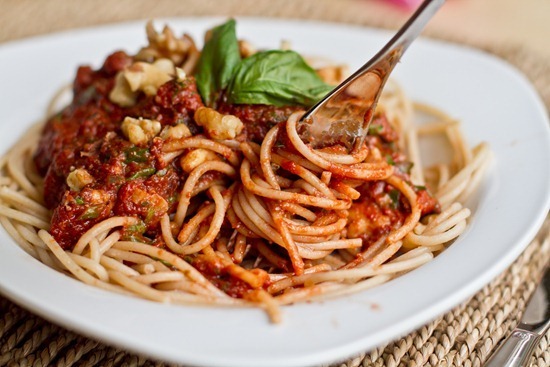 What a great idea to use nuts to make vegetarian pasta more filling and nutritious! I can’t believe I hadn’t thought of this. 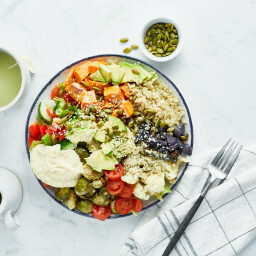 This looks so delish Angela, can’t wait to try it!!! btw, voted for you, Good Lukc!! I’m going to make this tomorrow, adding mushrooms to it! I have a spaghetti squash to use up too, will pour the sauce over pasta and spaghetti squash. I tried this recipe – it was amazing! Thank you. I do have one question. Have you ever had a reaction to nutritional yeast? Before this dish I have never tried it. After eating it I felt really warm, my skin tingled a bit and I had a really bad headache. Have you or anyone you know ever experienced these symptoms? I have been looking online and apparently there are some serious pros and cons to nutritional yeast since it is processed and in a similar family as MSG. Thoughts? Thanks for all the postings. I read daily and have tried many of your recipes. Keep Glowing! No I havent had that experience before. I’m sorry you did…maybe talk to your doc about it if it persists! My wife made this for me last week – soooooo good! 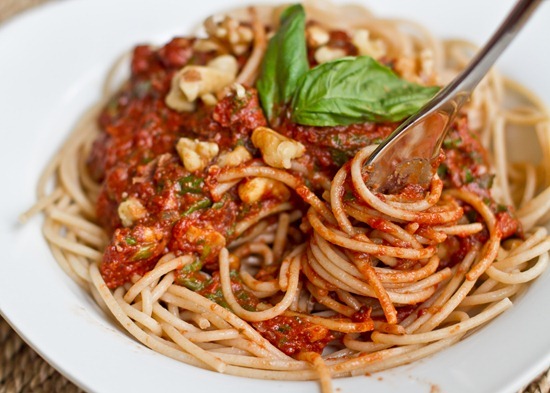 What a great idea to combine walnuts with basil sauce and pasta. Nuts and pasta need to get to know each other better as far as I’m concerned. I’m converted. Your pal, Vegman. I made this last week and wanted to tell you that it was the best pasta sauce I’ve had in a very long time!! I doubled it and served it to some family. They loved it! At first I was hesitant of the walnuts, but I was very happy! Added texture, but they also tasted a little ‘meaty’. This was so good that I actually forgo-ed dessert and instead had an extra spoonful of this! Also, with my leftovers I made meatball grinders with this sauce- perfect! Oh- and it was so easy and simple! Another plus! Thank you! How much pasta did you use? Soooo good! Just made this for two of my meat-eating friends and they loved it! Made this last night and it was a huge hit!!! Everyone loved it! Thank you for this recipe! Hey Angela! Do you by any chance have a nutrient analysis for this recipe?? Thanks! Just made this last night. Delicious!! I wasn’t sure about the walnuts, but I loved them. The nutritional yeast made it almost creamy-like. I think I will try it again and add some other veggies, maybe peppers and mushrooms. Thank-you so much for another great recipe!! What an awesome recipe! Thank you for sharing your ideas with us. It’s easy to be vegan when there are simple and tasty recipes like this. My husband and I really enjoyed it. Look forward to trying your other recipes! I make this recipe regularly. It is delicious! I barely make my own spaghetti recipe anymore! This is a great recipe. I’ve made it a few times now. I’m not able to recreate the deep red color you show in your beautiful photos, however, despite following the recipe to a tee. Mine turns out quite a bit lighter in color (I’m guessing due to the walnuts and nutritional yeast. How did you achieve such a rich red hue? Yum! I am currently eating this, awesome and super easy! Thanks! I made this for dinner tonight. I did add mushrooms. I used a 13.5 oz box of whole wheat pasta. Makes enough to feed a crowd! We enjoyed it very much. I will definitely make again. Sorry but I didn’t care for this at all. I can’t even say what it was that didn’t work for me. I followed the recipe very carefully and even waited a second day to see if it was better by then. Nope. Not saving any leftovers on this one.